Depth and length as dramatic as colors in southwest Wyoming gorges. Photo by Christine Tibbetts, Blended Family Traveling Mom. Glorious as they are, national parks fill up fast. 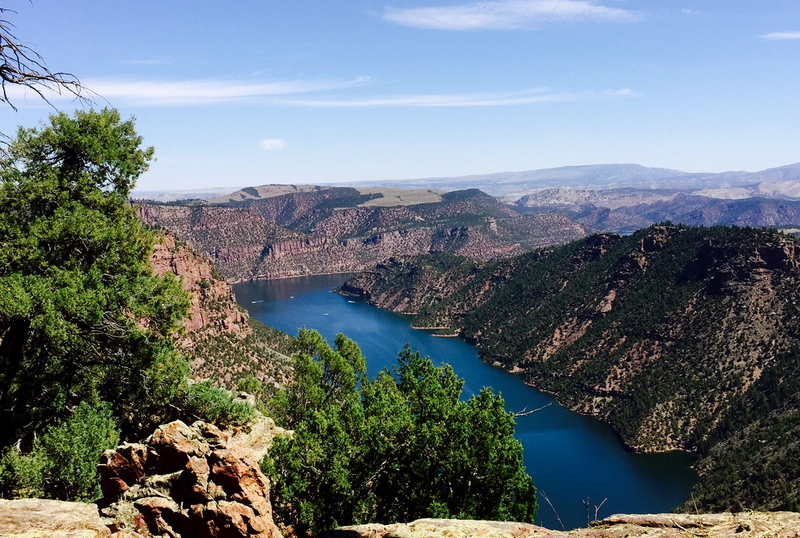 Need a so consider southwest Wyoming for up close family experiences in stunning gorges, nose-to-nose with ancient petroglyphs and way off-road with wild horses and towering buttes. Then mosey on to Yellowstone and Canyonlands, already satisfied and thrilled with the west. Sweetwater County is the southwest corner of Wyoming, touching Utah, and a retired Swiss Army truck is the preferred vehicle to forge deep into the wild western wilderness. Rock Springs and Green River are the towns but I recommend exploring beyond them. Here’s a two-day immersion schedule. Longer works too unless the national parks beckon too strongly. Book the all-day adventure with Rick Nobles and his Green River Wild Horse Tours. Leave your car behind because the gravel roads are isolated; your tires might be vulnerable and his open-air vehicle takes the bumps. 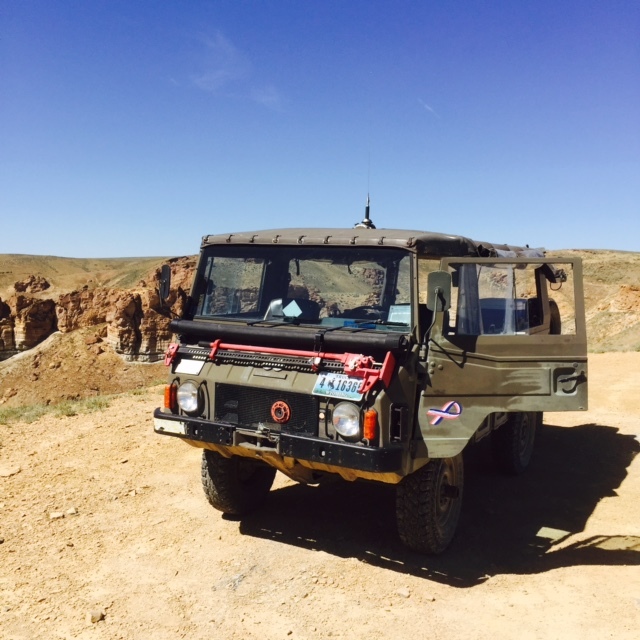 Best way to to experience Wild Horse Scenic Loop is a tour in this Swiss Army truck. Photo by Christine Tibbetts, Blended Family TravelingMom. 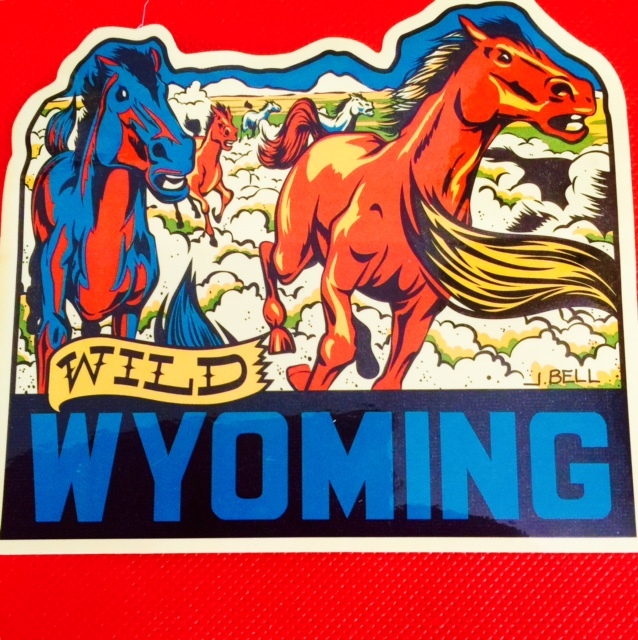 Seat belts strap everybody securely on bench seats but babies and toddlers are not likely to appreciate the bouncing, the dust or the fabulous stories of Wyoming that Nobles shares easily. 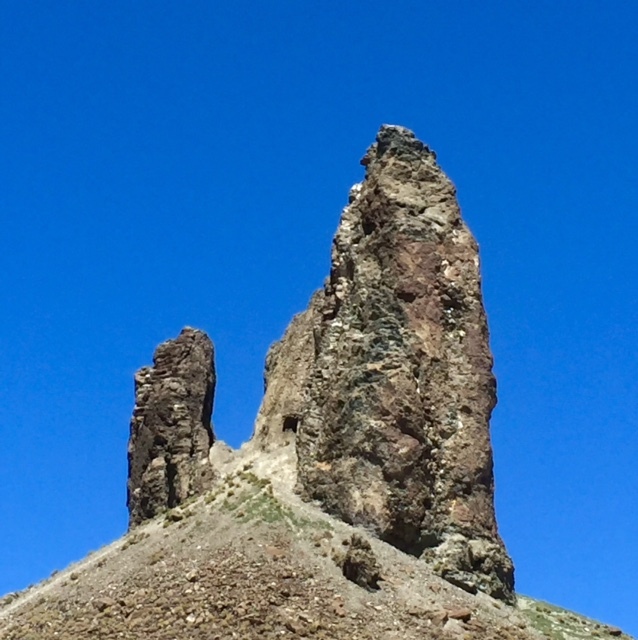 Spending the day with a rancher and oilman who knows every wild horse personally—or so it seems as he spots them around a bend, on the horizon or near a volcanic outcropping—is a privilege way beyond the $75 fee for the experience. Anticipate reverence in his enthusiasm for the west, and his deep desire to protect the lands as well as use and enjoy them. He’s a bit of a trickster too, so listen closely in case he’s pulling your leg with a tall tale mixed in with solid history. The main road that you can follow with a brochure is called Pilot Butte Wild Horse Scenic Loop. Notice the paragraph with High Desert Survival Tip: “reliable transportation is a must” and book the tour instead of driving. Wild horses can be elusive, yet well worth the wait for the flood of emotion spotting one on a high bluff, a sentinel to the old wild west, and also to the future it seemed to me. 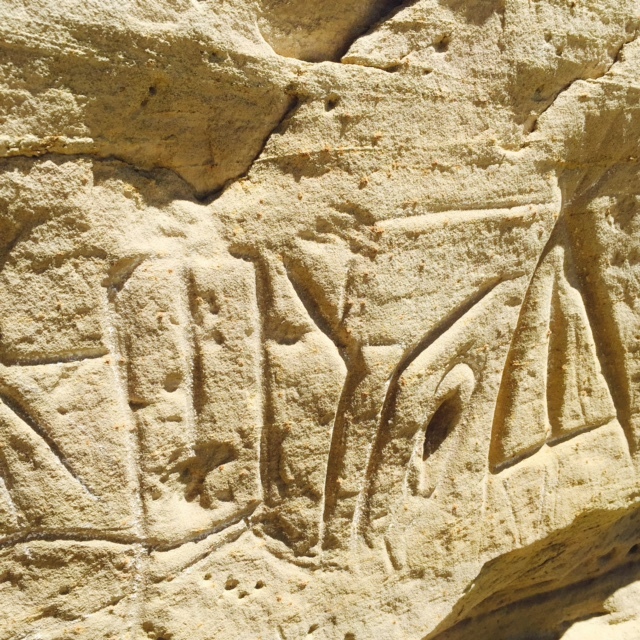 Ancient art appears in abundance on the White Mountains in southwest Wyoming, deeply etched lines from the Plains and Great Basin Native Americans. The White Mountains in Sweetwater County are the place to find detailed petroglyphs. Photo by Christine Tibbetts, Blended Family TravelingMom. You can get there two ways: drive yourself or ride with Rick Nobles. His deep reverence for the people who shared these stone writings and his knowledge of their meanings accumulated over years of gazing and studying adds value to the experience beyond your own sense of wonder. Either way the walk from the parking lot is a quarter mile at high elevation so take water. If you drive know the petroglyphs are 10 miles north of Rock Springs in Sweetwater County and then 14 more miles on a dirt road with two more miles on a rougher dirt road. Don’t touch, even though you can tell others have. Take advantage of encounters with carved lines depicting buffalo, birds, homes of perhaps 1,000 years ago to teach the children why the oils in our fingers will damage ancient art. Clambering up and down the sand dunes along the Wild Horse Scenic Loop is vastly different from avoiding the protected dunes at beaches in my native Jersey shore or now where I live near Georgia barrier islands. Killpecker Sand Dunes stretch 100 miles east to west and are considered the second largest active sand dune field in the world. That means lots of soft, deep sand triggered a million years ago by volcanic ash. Apparently the largest sand dunes in the western hemisphere are in Nebraska’s Sand Hills. Delicate yellow flowers are able to bloom in both, no soil evident. One section of Killpecker is carefully protected where the elk and deer favor birthing their young; a different 11,000 acres are designated for dune buggies and dirt bikes, ATVs with skilled riders and novices too. Geological eons of time can be readily seen on southwest Wyoming holiday. Photo by Christine Tibbetts, Blended Family TravelingMom. Facing west is Pilot Butte and at 7,949 feet tall it seems to be visible every which way I turned. That’s your compass, Rick Nobles tells visitors. Landscape memories filled the brains of ancient people, fur traders and pioneers walking these vast lands, guiding their comings and goings via sandstone and shale geologic forms. 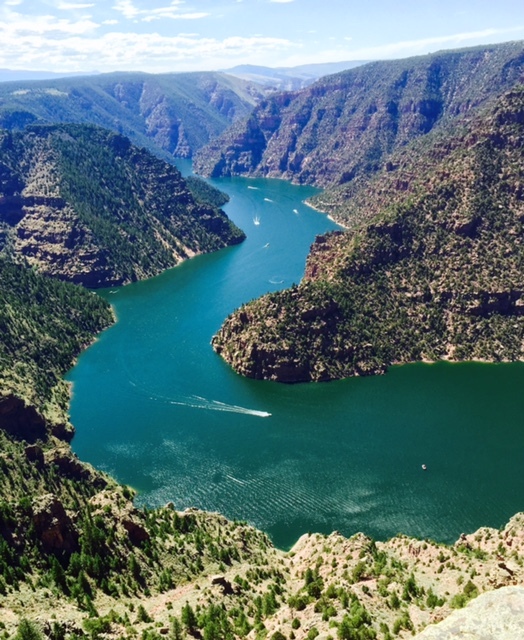 Feel confident driving yourself along the Flaming Gorge-Uintas National Scenic Byway and if you’re lucky, find a reservation at Red Canyon Lodge which fills fast. 2015 rates ranged from $119 to $159. Staying there in family-friendly cabins gives ample time to hike into gorge with its flaming colored rocks and deep blue waters, to canoe, kayak and standup paddleboard in the lake, ride horses along gorge trails and partake of chef-designed meals in the main lodge. Deep-water colors engage visitors in some spots, flaming walls in other canyons. Photo by Christine Tibbetts, Blended Family TravelingMom. The nearest traffic light is 40 miles away. The driving map for this Byway shows pullouts and other stopping points so you can get out with the kids and explore fossils and evidence of ancient life, ecosystems, gigantic views, wildlife and layers of time in the geology. Hang out a while in Ashley National Forest because the visitor center exhibits are nice and the bathrooms are too. Options on the off-road tour in wild horse country were just the sagebrush that takes 100 years to grow to any height so privacy is slim and squatting is vital. 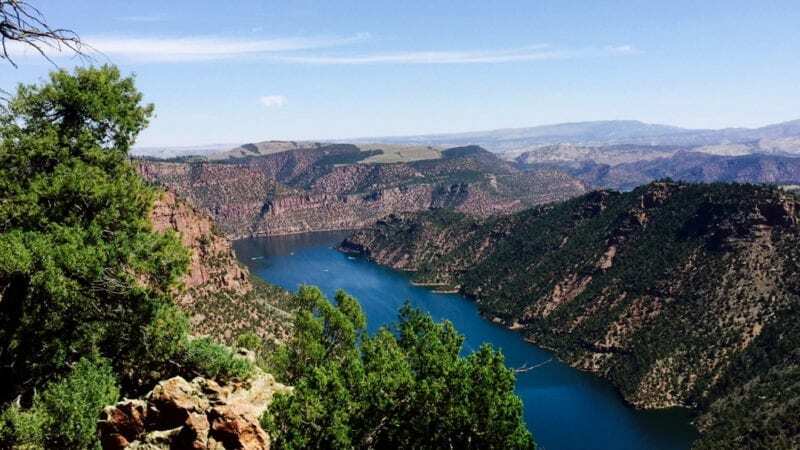 Ashely National Forest on the Flaming Gorge byway also provides safe, fenced overviews to see the splendor of the deep gorge. Wild horses are as real as they are colorful. Photo by Christine Tibbetts, Blended Family TravelingMom.